Do you sometimes have the feeling that you CAN’T quit drinking, no matter how hard you try? You might feel a strong resolve one day, but the next day you’re emptying bottle after bottle. It seems that no matter what you do or try, you always end up drinking again. And drinking way too much. What CAN you do to stop drinking when you constantly keep giving in to temptation? If you feel you CAN’T quit drinking, or haven’t been ABLE to quit so far, then you have to stop trying to do too much at one time. Just concentrate on SMALL, EASY-TO-ACHIEVE steps first. It is MUCH better to successfully take a small step toward sobriety than to fail at taking a big step. (Please read Baby Steps to Sobriety for more information). You may also need to CHANGE YOUR STRATEGY and try the OPPOSITE of what you’ve tried before. For example, instead of trying to completely quit, perhaps you need to take steps to REDUCE your alcohol intake. This different approach will allow you to begin to get your drinking under control. And hopefully after a few weeks or months of cutting back you will then find the strength to quit, once and for all. The point of these steps is that they will help you focus on what you CAN do, and not on what you CAN’T do. These aren’t perfect solutions that will miraculously reduce your desire for alcohol. But they ARE important steps for you to take if you are serious about getting your life back in control once again. STOP TRYING THE SAME STRATEGY THAT YOU USED BEFORE. If before you kept trying to quit “cold turkey” then you should realize that this approach didn’t work for you. It’s important to recognize that the METHOD you used failed, not you. Try a different approach, and you’ll likely get different results. DRINK SLOWLY. Nurse a drink over good food and interesting conversation. Avoid shots. Don’t even take the first one. There is NO reason to drink shots, or slam beers unless you intend on getting drunk, feeling lousy, and sowing the seeds for your life to be messed up in every way possible. EAT 3 MEALS A DAY. The best way to avoid getting carried away with alcohol is by eating 3 square meals a day. When you make 100% certain that you enjoy a healthy breakfast, lunch and dinner, you’ll be amazed at how low the urge to abuse alcohol becomes. DO NOT STORE ALCOHOL AT HOME OR WORK. You must never, ever keep alcohol at home or work … for any reason. When you stop keeping alcohol around your home and office you remove the source of temptation. 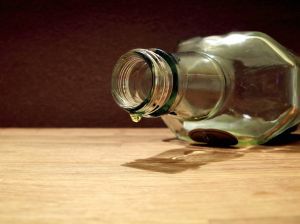 By making it a LESS CONVENIENT to drink, you are thereby making it easier to spend another day clear-headed and sober. And you’ll guarantee yourself another day of waking up feeling good about yourself and your life. The only thing that’s worse than having an alcohol problem is having an alcohol problem and doing NOTHING about it. You know you have a problem, now you must DO SOMETHING to change your lifestyle. But, if you feel you can’t quit drinking, then focus on small steps at first (like the 4 mentioned above).